President Michael Higgins signed the law change into effect in advance of the religious holiday this year after overwhelming support for the move in parliament. 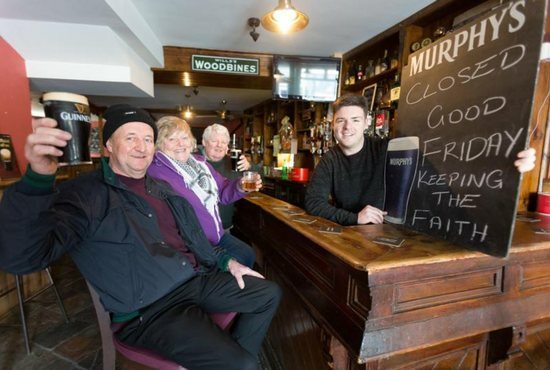 In Drumconrath, County Meath — north of Dublin — the three local pub owners have joined forces to observe the Good Friday tradition. Dermot Muldoon, Pauline Fay and Pat Dempsey have declared they will honor the time-old tradition this year. “Publicans get two days off in the whole year — just two — so we decided to keep that holiday as well as keeping up the tradition and having a bit of respect for our religion,” said Muldoon. “It is going against the grain — but who knows? Other pubs around the country may follow,” he said. Over the years, revelers determined to have a drink found increasingly novel ways to indulge. Alcohol was not banned on trains, so people often bought train tickets for unnecessary return journeys in order to buy drinks. Similarly, some people in border counties organized trips to Northern Ireland where no such ban was in place.